Kristyn is proud to announce that she will be deputy choreographer under Jean Butler for UCD’s Scholar dance programme and Irish dance Ensemble. For more information click here. ​Classes are back in session! Kristyn is back in the Irish World Academy of Music and Dance at the University of Limerick teaching on the BA and MA courses. Her teaching aesthetic uses her knowledge of Irish dance in a contemporary dance context and is open to all dancers and creatives. She has also started back with her 50+ dance class at Dance Limerick, the High Kickers of Limerick. Kristyn was delighted to help co-produce and manage Laura Murphy's dance piece ABACUS as part of the Dublin Fringe Festival. Abacus expresses the effects of routine and monotony on us. It asks whether there is harmony in routine, and if there is ever anything original in repetition. It identifies the freedom and beauty in the everyday. Abacus is a contemporary dance performance for 9 women and 18 buckets. The performers take the buckets through a 40 minute sequence of routines that echo the experience of work. The women have become so well versed at their tasks on the 'night shift' that they perform their work with an eerie precision that locates the beauty in work and gestures. Each month, HomePlace invites a leading artist to respond – in whatever way they choose – to one of Seamus Heaney’s celebrated poetry collections. 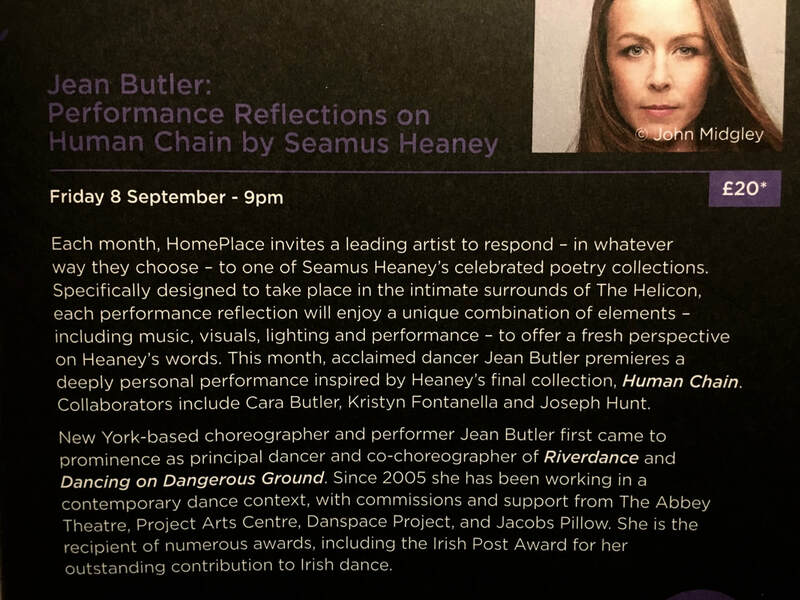 This month acclaimed dancer Jean Butler premiers a piece inspired by Heaney’s final collection, Human Chain. Kristyn collaborated with Jean as well as dancer Cara Butler and sound designer Joe Hunt. This residency included one week at the Tyrone Guthrie Centre in Monaghan and then a following week in the Seamus Heaney HomePlace in Bellaghy. Kristyn was honored and beyond excited to join this talent group from Ramallah Palestine as well as other local Irish dance artist for a weekend dance retreat on Inis Oirr. Special thanks to Ríonach Ni Neill for organizing such a special cultural exchange through dance. Dance Ireland's Make & Move programme provided seven emerging choreographers with a two week intensive in choreographic practice in the Creation Studio at Dance House Dublin from the 17th-29th of July 2017. The participants were mentored by choreographer and DI Associate Artist Catherine Young, who encouraged critical engagement with aU personal practice from a theoretical perspective. By working with like-minded individuals, Kristyn was lead to discover new resources and pathways from their shared practices. This programme was a benefit to Kristyn at this stage in her choreographic journey; with new creative tools, she has taken a deeper look into her current body of work, and is continuing to breakdown her dance material to investigate her questions/creative process even more. Kristyn has recently been appointed as the Programme Assistant to Galway Dance Project. She is currently assisting with the management of the development and associated activities for the Galway2020 project, supports the delivery of any workshops and planning of public events, and supports the General Manager in delivering Galway Dance Project’s ongoing programme and it’s communications. 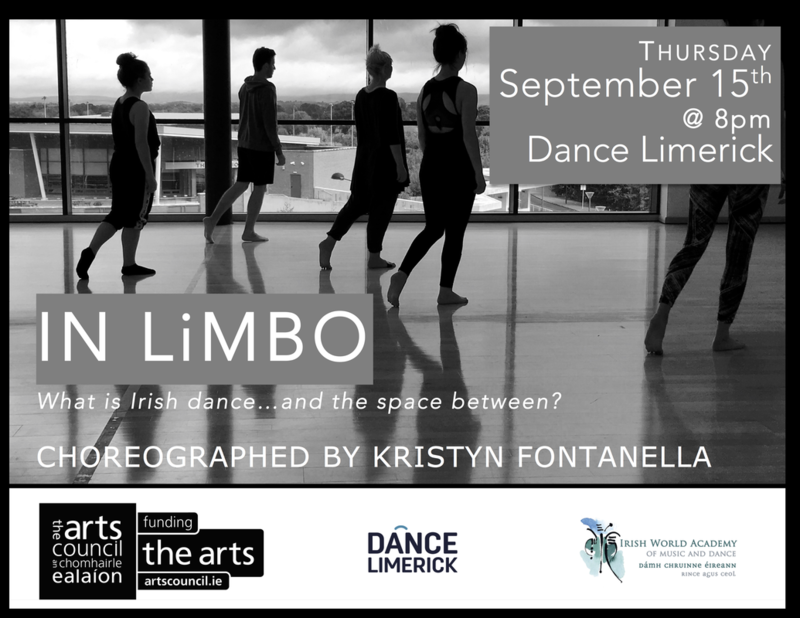 IN LiMBO seeks to answer the question 'What Is Irish Dance?' and Kristyn Fontanella Dance present a compelling answer in their engaging performance that sits perfectly between moods and genres. Never straying into the alienating effect sometimes created by contemporary dance, and maintaining flexibility in their interpretation of traditional Irish dance, the company have created a unique space within their medium. They have found a way to extract recognisable elements from genres and blend them harmoniously. The result is a sequence of often seemingly instinctual movements that blend seamlessly into highly choreographed (but never rigid) dance. The deep connection between the members of group is evident, used to full effect to create surprising moments and showcase both their individual talents and the power that a troupe can have. Special mention goes to the excellent costumes, and above all the music, which was skillful, thoughtful, and a perfect partner to the dancers. Take whatever chance you can to see this: whether you know dance or not, you'll find something new. As well as a weeks residency in Dublin at the Fringe Lab from the Dublin Fringe in April 2017 to continue work to complete this production. Kristyn also has residencies with Sibéal Davitt in Dance Limerick and DanceHouse to continue work on their duet 'As We Know It'. More exciting news about this piece to come! Kristyn has been very busy and active in the dance community at the end of 2016. She has taking up a lead role in the Limerick Dance Collective where the group is focusing the next year to facilitate a community of dance artists and nurture peer-lead professional practice. 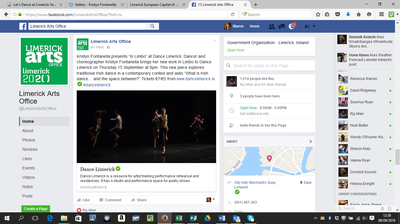 LDC will hold open labs for local dancers throughout the new year at Dance Limerick - check there website here for dates and times. 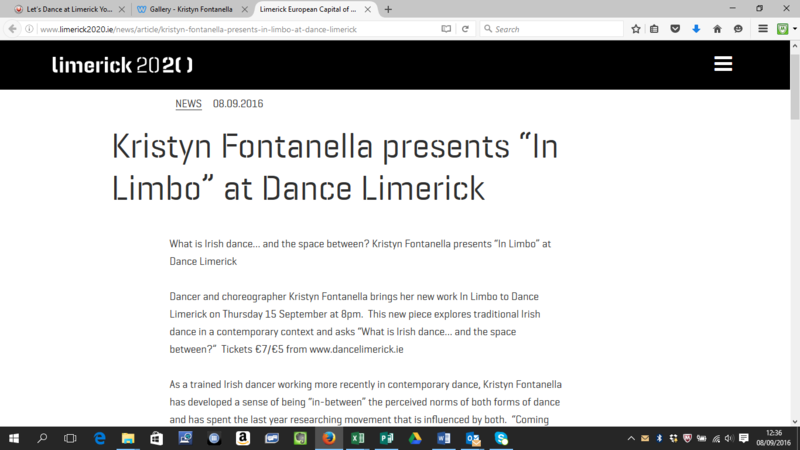 Kristyn has also been appointed as a board member of DRFI (Dance Research Forum Ireland) as well as the chair of the Dance Strand for LACE (Limerick Arts and Cultural Exchange). After the showing of IN LiMBO, the piece has received high praise and has begun its upward momentum to being completed. Here are some news articles highlighting this work-in-progress showing. 'As We Know It' was invited to show at an Open Studio at the 2016 Tanzmesse nrw in Düsseldorf, Germany. We had an amazing experience and meet a lot of influential people who we will definitely keep in contact. Special thanks to Culture Ireland who supported our trip and showing. 'As We Know It' premiered in NYC with Dance Research Forum Ireland's 2016 Conference - UpRising. Kristyn and Sibéal were thrilled with the feedback from the conference and look forward to the future of this piece. Kristyn is now a board member of DRFI and you can find out more information about the organization here. Kristyn was privileged to travel to the Kennedy Centre in Washington D.C. to assist with Jean Butler and Neil Martin's duet 'this is an Irish dance'. 'hup' performed at Laois Dance Platform at the Dunamaise Arts Centre in Port Laois. ULITMA THULE performed in Cork and Dublin to sold out shows. Kristyn was thrilled to be a part of the ensemble work for choreographer Catherine Young and her amazing dancers. Kristyn has been asked to perform at this year Laois Dance Platform on May 14th at 7pm at the Dunamaise Arts Centre. Kristyn will be joined by Co. Meath fiddle player Gillian Power (owner of The Trill of Music) performing her solo dance piece titled 'hup'. This project is being rehearsed at the Belltable Arts Centre in Limerick this week and is supported by the Limerick City & County Council through their Grants under the Arts Scheme. 'As We Know It' was asked to perform as part of the Atelier Symposium - an exploration of how artistic identity is maintained in a nomadic life at DanceHouse Dublin. The piece was warmly welcomed and a lot of interest was shown in the talk back after the performance. Kristyn and Sibéal are delighted with the work and look forward to completing it in 2016 so it can then be shown in other venues and events across Ireland (hopefully abroad). ​Video of rehearsals and showing here. Kristyn is delighted to announce that she is the recipient of the 2015 Traditional Arts Bursary Award from the Arts Council Ireland. Keep a look out for her new work in 2016 title - IN LIMBO. Kristyn travelled to NYC to prepare for the world premier of 'this is and Irish dance' at Danspace - Choreographed by Jean Butler and Composed by Neil Martin. It has been an amazing year creating with such legends in the arts world. 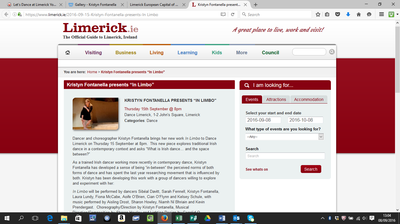 Kristyn could not be more excited about the future of this piece and their performance in May of 2016 at the Kennedy Centre Washington D.C.
Kristyn is delighted to be invited as part of a panel discussion for this years Healthier Dancer Week presented by Dance Ireland. Kristyn is one of five dance artists that will be speaking about injury and their own insights, reflections and perspectives on Thursday October 22nd at 2pm in Dance House Dublin. 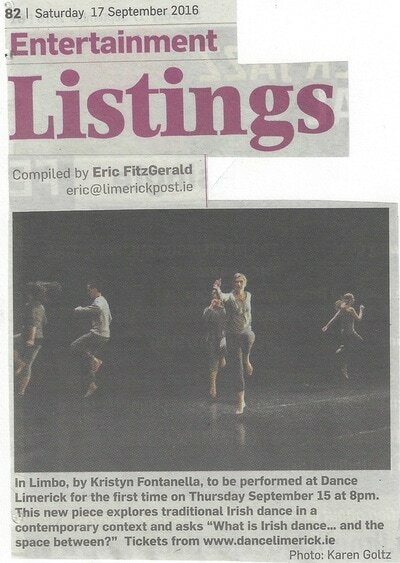 This is the second of two weeks that Kristyn and Sibéal Davitt are in residency in Dance Limerick. They will be showing their work-in-progress titled 'As we know it' Thursday Oct. 8th at 7:30pm in Dance Limerick with a Q&A afterwards facilitated by Colin Dunne. 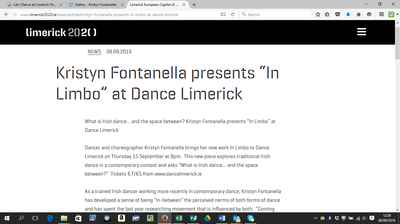 This week Kristyn will be in residency at Dance Limerick (check out Dance Limerick's new promotional video here). She will be inviting 5 very talented graduates of the BA of Irish Music and dance program to join here in the exploration of what Irish dance is to each individual. Keep a look out for video footage of these workshops soon! Thank you to Philip Connaughton for wonderful morning classes all this week, along with the Step Up dance program and Dance Limerick for the invite to join, I had a blast! Kristyn traveled to the South of France with Jean Butler and Neil Martin to show their work in progress 'this is an Irish dance'. 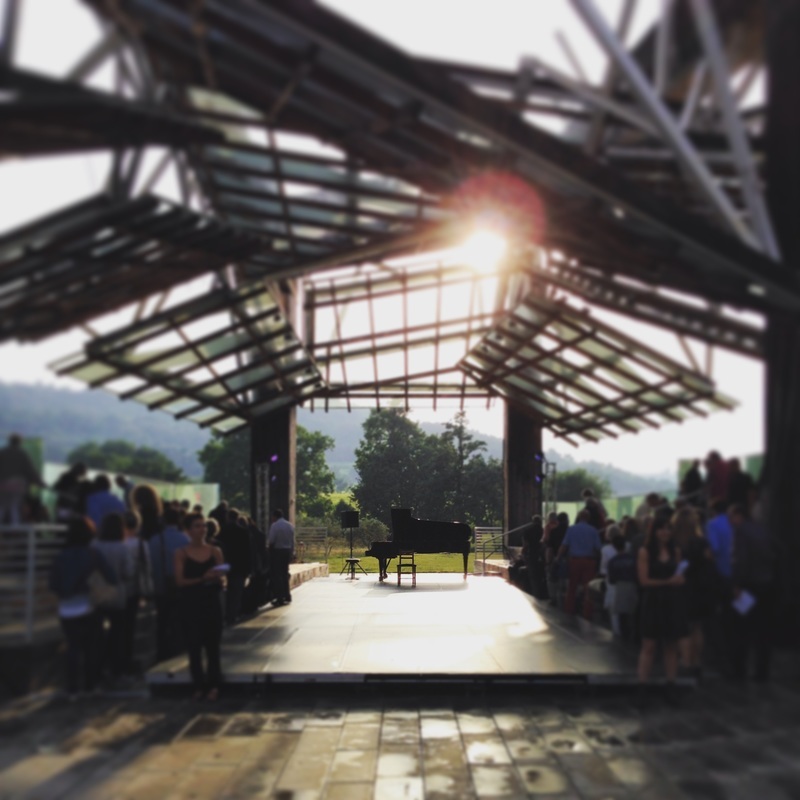 The showing, which was a sold out success, took place on Château la Coste just outside of Aix en Provence. Thanks to the friends and staff of the vineyard for such a hospitable visit. 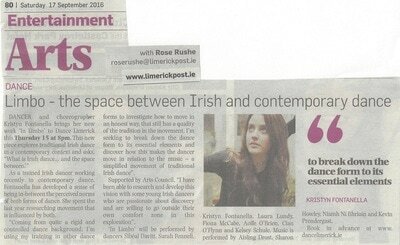 Kristyn was recently shortlisted for the position of Associate Artist for Dance Ireland. Although not successful this time around, she is excited to continue on with her proposed project outline for 2015-2016. Congratulation goes out to ﻿Patricia Crosbie ﻿on attaining the new position. This month also marks the end of the school year at the Irish World Academy of Music and Dance at the University of Limerick. It was a pleasure and a joy to teach the 2nd and 4th year students on the BA course in Voice and Dance as well as on the MA program in Traditional Irish Dance. I look forward to teaching the next semester of students in the fall of 2015. 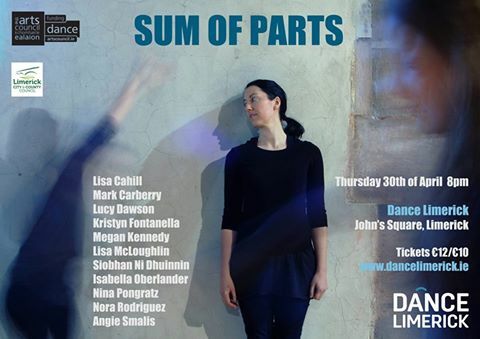 Tonight is the showing of the Limerick Dance Collective's first collaboration of Sum of Parts. Tickets may be purchased through Dance Limerick. Hope to see you all there at 8pm. A productive week spent at the lovely Síamsa Tíre National Folk Park in Tralee with Jean Butler and Neil Martin working on their duet. Kristyn was so pleased to be a part of the TOCHT festival and can not wait to return. April 30th at 8pm in Dance Limerick. Kristyn was fortunate enough to have been one of the few artist to enjoy the serenity and space at the Tyrone Guthrie Centre in Monaghan this past week. Working along side Jean Butler and Neil Martin, this was a treat beyond imagination. Kristyn can not wait to get back to the centre to get lost in her own work some day soon. Come see Kristyn perform an adaptation of her final performance piece titled 'hup', at the International Women's Day Performance at the Irish World Academy. Find more information about this even presented by artist Kathleen Turner below. Videographer Lucy Dawson will be capturing this event, and it will be shared on here soon! Kristyn is excited to start teaching the next generation of dancers in the Limerick area at Dance Limerick this new year. Take a look at some of the classes that are offered. You can see Kristyn here on TG4 show, Imeall, working with Colin Dunne and﻿ Sibeal Davitt ﻿during her Dance Ireland Mentoring Residency in December. 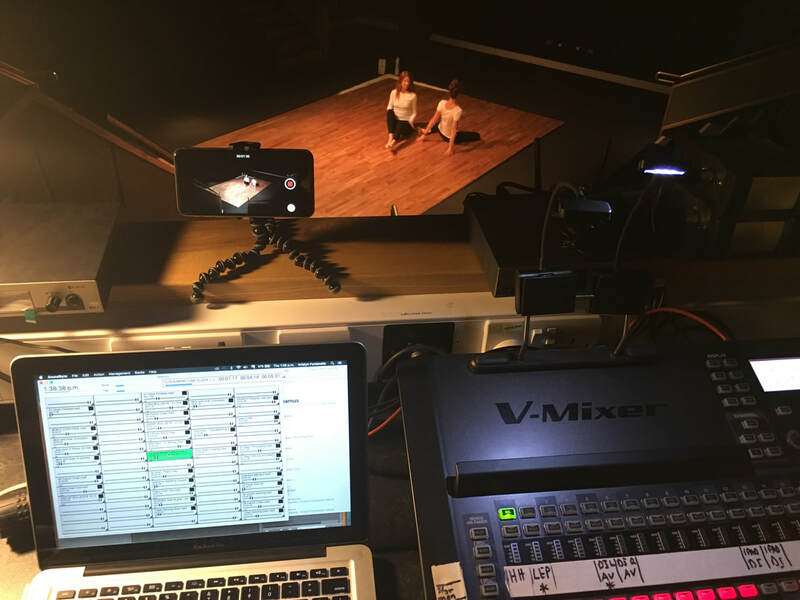 Since meeting on the MA Contemporary Dance Performance program at the University of Limerick this year, Sibéal Davitt and Kristyn Fontanella have found many similarities during their venture from traditional into contemporary movement. They are delighted with being awarded Dance Ireland’s Mentored Residency in Traditional Dance under world-renowned dance artist and performer Colin Dunne. 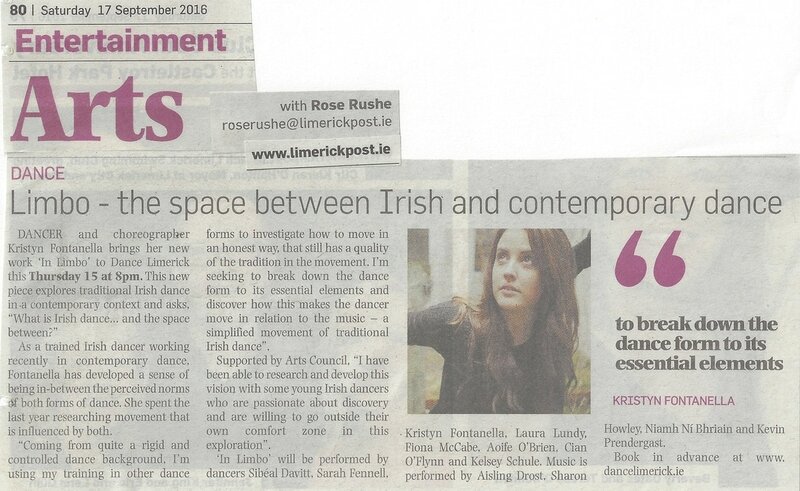 The aim of their residency is to explore the connections between the established styles of traditional dance (step dance and sean-nós dance), as well as finding a new language of movement to traditional music. Both dancers are looking at sean-nós and step dancing from different perspectives and finding ways in which they can create new choreography, which is unique to Sibéal and Kristyn as traditional/contemporary dancers. While working closely with traditional music, they are using different choreographic methods such as spoken word, floor patterns, and improvisation. 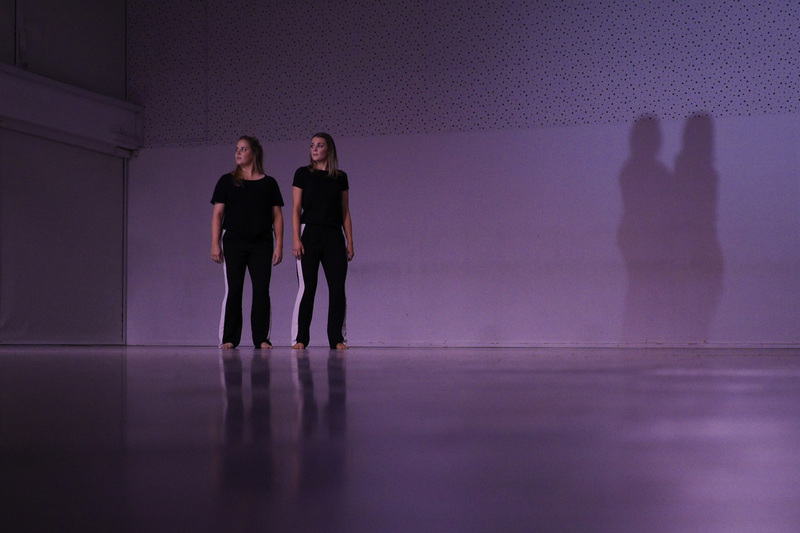 Sibéal and Kristyn aim to show their findings at the end of their residency at DanceHouse on Friday the 5th December. This month marks the end of Kristyn's MA program with her final solo performance titled 'The Set'. It was a nice change for her to use the knowledge of her past traditional dance background mixed with the new tools she has gathered this year in the course. Live music filled the room as the audience was asked to join Kristyn on stage for her pub like session dance. Kristyn is also proud to announce that she has accepted a job as a tutor at the Irish World Academy teaching portions of the undergraduate and postgraduate modules. She looks forward to what this new position has to offer and how it will aid in her ongoing practice as a dance artist. This month marks the start of Kristyn's 6 week involvement with the Step Up Dance Program at the University of Limerick. Along with daily classes with Irish choreographer Michael Keegan-Dolan, Kristyn's role as Program Assistant will have her busy helping out in all areas of this production. Kristyn was thrilled to perform 'A Dance Concerto' to a sold out crowd in Cork. Great work by all dancers and community cast, and especially to choreographer Laura Murphy. And to this great week, Kristyn was extremely pleased to assist Jean Butler and Neil Martin on some of their new collaborative work in a residency at Dance Limerick. The summer has started off amazingly, and she can not wait to see what the future will bring. Kristyn was thrilled to participate in the CHO-LAB this week at Dance Limerick with Jazmin Chiodi and Alexandre Iseli, co-founders and directors of Iseli-Chiodi Dance Company. And now it is back to Cork to continue rehearsals for 'A Dance Concerto' at the Firkin Crane. Rehearsals have begun in Cork for 'A Dance Concerto' choreographed by the Firkin Cranes' Dancer in Residence, Laura Murphy. Kristyn is thrilled to be apart of this production and happy to dance with the community of Cork. For more information on 'A Dance Concerto' performing on June 19th @ 6:30pm in the Millennium Hall, Cork City Hall please click below. Kristyn has just performed her second semester solo for the MA in Contemporary Dance Performance in the Irish World Academy at the University of Limerick. 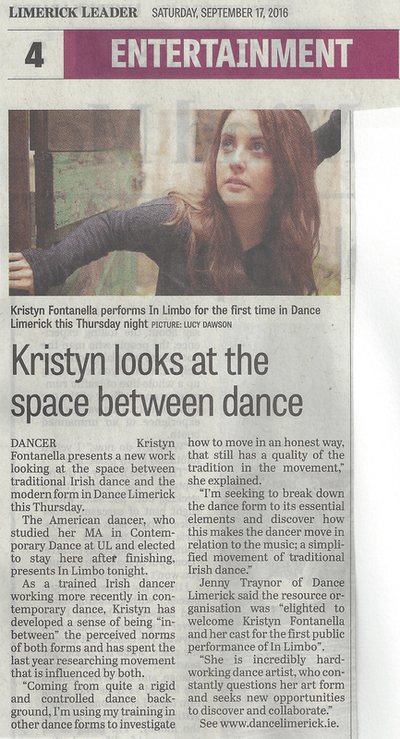 She is now residing in Limerick working on her choreography for the third and final semester of her Masters Degree. This work will focus on a collaboration between Irish Step Dancers and herself using what they know of their specialised technique and using it in a contemporary dance setting.